Welcome to the fourth installment of gifts you can make. Gifts to Make #4 Handmade Tags or The Easiest Anthro Knockoff Ever! Although these are gift tags and not gifts per se, you could package eight or so in a glassine bag and give them as a gift. They are too cute not to! Way back in the middle of November I had shared with you my holiday knock off aspirations. One project I had listed were these darling Anthropologie penmanship gift tags. I have to say of all the Anthro knockoffs I’ve created this has been by far the easiest. 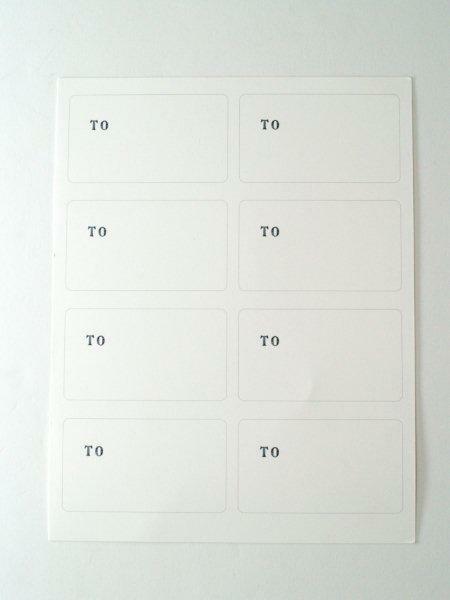 You begin by printing out tags that say “TO”. Flamingo Toes created a wonderful template. Other crafters have cut the tags out by hand. I opted to use my scrapbooking paper trimmer as a time-saving measure. This does cut down on the artisanal effect of using scissors, but I was ok with that. Next, a scrapbooking corner clipper rounded the corner edges and a paper punch was used to create a hole in the upper left-hand corner. Of course, I couldn’t just stop with the basic red and blue thread pairing, so I tried pink and mint. Followed by pink and blue. My favorite though was red and teal. We are halfway through the Gifts You Can Make series. Have you been creating lately? Cute project!! Enjoying your gifts to make series. That is so neat! I love the rainbow stiching! I am saving this idea! You are so clever!!! So cute and so simple! Brilliant!! Girl…you are on a creative roll….those are really cute, and you sewed them!! Amazing! These are the cutest tags ever! I am helping out with a bake sale soon and I think these are a must for the glassine packaging with bakers twine to boot, thank you for sharing a great idea. These are soooo cute but it would also mean I would have to drag my sewing machine out. Lazy here thinks that is too much work BUT she may try them with an embossing pen and powder. I wonder????!? I'm right there with you on the paper trimmer! These are too cute. I think the rainbow's my favorite! Be sure to stop on by and enter my holiday giveaway, ends 12/16! What a cute idea! They just might be a good enough reason to get my sewing machine out! These are wonderful! I will have to give this a try! Thank you for the sweet comment on my blog! Love the red and green. I wish they were a way to do them where I didn't have to drag the sewing machine out of the basement. Cute, cute, cute! Thanks for stopping by my blog! Thanks for stopped by and for your sweet comment about my ornaments! I love these tags! Great work. Those turned out cute! Love the colored thread on them! Super cute! I love these!!! Wow what a brilliant idea! So cute. These are sweet! I love the multicolored thread! Thanks for stopping by my blog recently!! Thanks for your note on my blog – I'm so happy to have found your Christmas gift ideas! Oh my goodness, simply perfect!! You have a crafting touch, thats for sure!! Thanks for stopping by my blog! Thanks for stopping by my blog and leaving such a sweet message on my sheet music wreath. I'm glad you liked it so much. Oh, these are great! I love the stitching detail! Thanks for visiting the space between today! Happy Holidays!! These are so cute and great tute, too. I hope you are enjoying the holiday season so far.